Sometimes we all get a little burned out from our usual grind, even if we are lucky enough to have work that doesn’t always feel like “work.” In this digital age, with all the possibilities for telecommuting and working remotely, there are few good reasons why we should constantly settle for not finding variety. Mix things up! Go to a new location to work for a few days! Think of a project which will (a) fulfill your professional ambitions, (b) show off some of your best skills, (c) excite you in the process, and (d) challenge you in new ways to find new capabilities. This is what I did in 2014. Each year, in January I try to establish a new goal or professional priority for myself. I don’t like resolutions and I am usually working on a contract basis, so I must challenge myself to grow and develop in new ways. In 2014, my goal was to find a way to do work (paid or unpaid — but not costing me much!) in Spain. I’d spent a couple of weeks in southern Spain the year prior, on a family vacation, reminding myself how much I loved that lifestyle, the culinaria, all the glorious sun. So I started by telling people of my intentions. Long story short, I found an artists’ residency with an open call for submissions — for any project you’d like to undertake — from visual artists and researchers, around the theme of “making neighborhood” in Barcelona. Perfect. 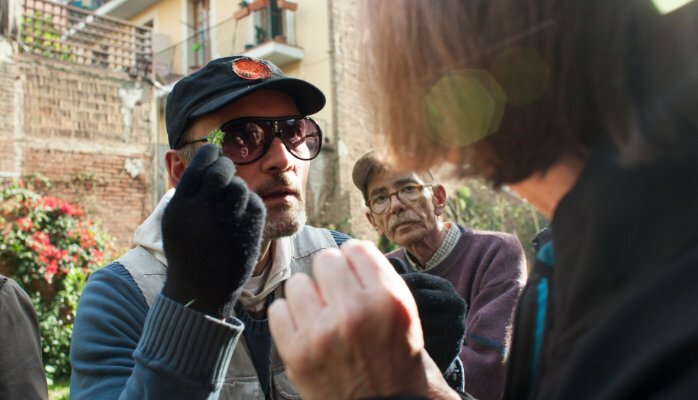 I thought about it a long time, then spent much of the time around July 4 that year writing a long proposal to study urban gardening in Barcelona through a series of 6 videos. Each video would be able to stand alone, telling a unique story, but would create a larger picture of how to bring people together through gardening. In just over 6 weeks total, I knew it would be a daunting challenge — researching, getting to know people, interviewing, shooting and editing, all in Spanish, one-man-band-style — but I knew it would be a great challenge and a fun project. The artist residency could cover most of my expenses, aside from food and trasportation to/from Spain. I would save and just make the rest happen. I wrapped up many projects, put a few larger projects on hold, told clients I would be back, found trustworthy people to watch my house and dogs, and took off to spend November and December in Barcelona! Yes, it was daunting and a huge challenge and I didn’t shoot anything at all for the first ten days (which drove me slightly mad), but it all worked out and I had one of the more impressive of the projects for the group of four artists participating. Each video examination of urban gardening contained a different message. They were all edited by the time I left Barcelona in late December. And I still had lots of time for nightlife fun, seeing Gaudí masterpieces, and Barça futbol games (at Camp Nou). But the rewards of the work were (and still are) immense for me professionally. I won’t explain too much of the subject matter I covered. If you want, you can see the videos for yourself on wilweldon.com (under International) and feel free to email be with questions. In short, they were collectively about finding new ways to tackle an ancient topic, about bringing people together, and about overcoming an immense economic crisis that’s left millions of people without gainful employment. The people and the stories are bright and uplifting. The lessons I brought back were immense. I could drop myself into a new city, speaking a non-native language with limited assistance (my Spanish was strong already, but not “fluent”), with limited funds, with no idea who would see or how my work would be used, working with a short turnaround, and make a dream project happen. I found new ways of using my cameras. I found new ways of interviewing people, strengthening what I still consider my strong suit in my trade. And, perhaps most importantly, I found ways of manipulating a long-winded cultural narrative tradition into short-form stories. (Many of the Spaniards I encountered were amazed at the ways I condensed the stories into short films, something Europeans have not entirely mastered in non-fiction.) A national radio show in Spain interviewed me and celebrated my work. On my return, one of my favorite radio programs also interviewed me and featured my work prominently on their web site. Did I make a lot of money from any of this? No. Was I able to pitch the series of videos successfully to a publication for more widespread distribution? No. But those are lessons for the next dream project. The important part now is knowing that I can create a Dream Project, see it to completion, and happily embrace new challenges — all while not going broke and finding ways to inspire others.